Hoichoi has started streaming original film titled ‘Boomerang’. The film is a fun take on ‘karma’ as in, “what goes around definitely comes back around”. 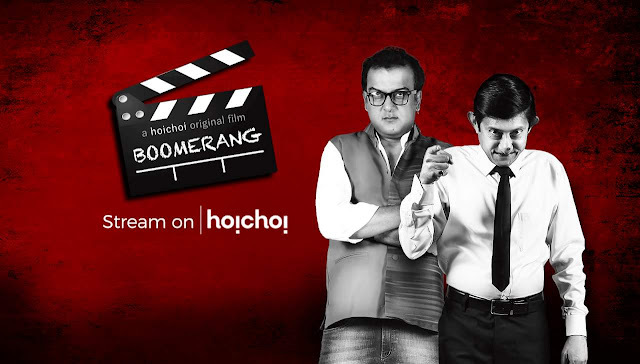 Directed by debut director Sudipta Majumdar, who is known for being a cinematographer for Hoichoi’s popular Byomkesh web series, Boomerang is streaming on the Hoichoi app and website from 21st July. Boomerang is about four characters – a filmmaker (Sujan Mukherjee), a salesman (Kanchan Mullick), a police inspector (Paran Bandopadhyay), a journalist (Anindita Bose) and is a social satire which throws a dig at artists who blatantly copy others’ work, remake films and pass off as their own. Akshar Nandi is an established Bengali filmmaker who mainly copies South Indian movies. As the audience is nowadays looking for authentic stories, he starts looking for a new story with a unique concept. On the birthday of his girlfriend, Mitra a salesman who literally sells everything and anything named Rakhahari visits Akshar’s home and continuously nags him. Meanwhile, Akshar comes across Rakhahari’s diary where he finds a very interesting story and decides to make his film based on the same. During the negotiation process, a sudden accident happens. That very moment Mitra and her uncle Police Inspector Paramananda Bhat visits Akshar’s house. This follows sudden situations that turn dramatically and drastically through some twists and turns resulting in an unanticipated climax.